I am a big breakfast guy, so it's not a stretch to realize I'm always looking for a way to incorporate the grill into my weekend morning routine. If it happens to include grilling a steak, then so be it! The origin of Eggs Benedict is up for debate, but the construction is straightforward: English muffin, Canadian bacon, poached egg, and hollandaise sauce. With most things, there are also endless variations. Add spinach, call it Eggs Florentine. Add salmon, and it's Eggs Atlantic. Add a slice of grilled beef filet and you have Filet Mignon Eggs Benedict. It's rich, it's divine, and it will make you wish you made more. 1 Beef tenderloin filet, about 2 inches thick. Let's talk about the sauce. There are two schools of thought here: difficult or easy. Sauce preparations are something I enjoy but never get enough practice with. James Peterson's Sauces isn't exactly light reading. Not surprisingly, I took the difficult route. Practice, right?! For the easy, and probably still better than mine, route, head on over to the Pioneer Woman. Prepare clarified butter by melting butter in a saucepan over medium heat. Be sure the butter does not burn. Remove the pan from the heat and with a ladle, skim off the white froth. Set the butter, now clarified, aside and keep warm. Place the egg yolks in a saucier pan. Add the cold water and whisk until frothy. While emulsifications can call for a double boiler, Patterson argues for direct medium-high heat. The process is faster, meeting the demands of a professional kitchen, and makes for a better-flavored sauce. Over direct medium to high heat, rapidly whisk the egg mixture. As it reaches the proper temperature, the mixture will suddenly thicken, and the bottom of the pan will become visible. Continue to whisk for 5 seconds to allow complete cooking, then remove from the heat and whisk for an additional 20 seconds to help it cool. If you cook it too long, the eggs will curdle. Ladle the clarified butter, of which you should have about 2 cups of, into the egg emulsification. Stir with the whisk the entire time. Finish the sauce with about 2 T of lemon juice. Prepare a 2 zone fire for direct medium-high heat. Brush the filet with olive oil and season generously with salt and pepper. When grilling a filet, I almost always use a reverse sear. Start the filet over indirect heat and close the lid. A temperature probe is key here, as it helps hit the target temp. I tend to shoot for 115 F in order to finish the meat off medium rare. Figure about 10-12 minutes, then, once 115 is hit, move to direct heat, grill for one minute a side. Remove and allow to rest. While the meat is grilling indirect, let's poach eggs. Fill a medium pan with water and about a 1/4 cup of white vinegar. Bring to a boil. Break the eggs into prep bowls. With the water at a boil, slide the eggs in keeping the bowl as close to the surface as possible to keep the whites together. Allow to cook for approximately 2 minutes for soft yolks. The eggs should start to float back to the surface. Using a slotted spoon or mesh strainer, remove and set aside. Brush the English muffin slices with butter and grill over direct heat for approximately 45 seconds, cut side down. Once the meat has rested, slice in half horizontally. 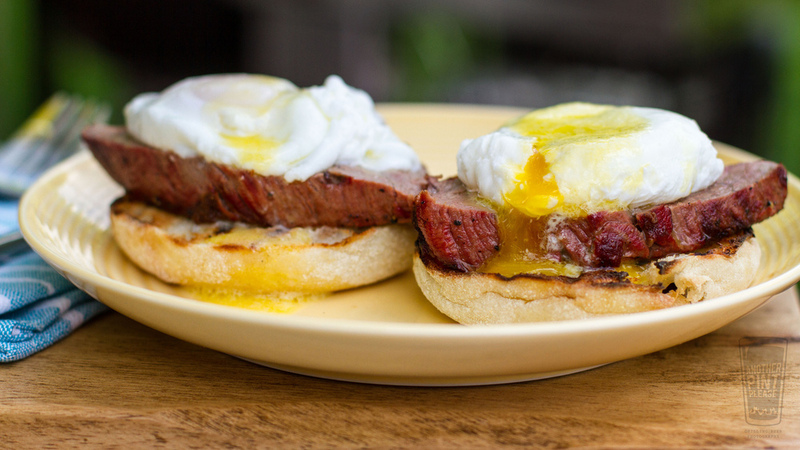 Stack the filet on the English Muffin, then top with a poached egg. Spoon on the hollandaise. This is a rich breakfast and a little goes a long way. When you hear someone say breakfast is the most imporatnt meal of this day, this is what they are talking about. Lobster Benedict with Hopped "Beer-naise"